Our plants are home to a multitude of other species including a massive furry caterpillar that looks identical to one of the leaves. These plants seem to have been connected to the lemon tree for many years and are happily growing and floating over the lemon tree branches. We are moving house soon and will miss the air plants in our new home. Does anyone know of a way we can take a small cutting without harming the parent plant and ensuring the cutting survives? You can just break off a piece of the “stem” and take it with you – that’s how we obtained our first piece. When you get to your new place just hang the new piece in a tree with a similar position to where it is currently growing. cool plant! does it take anything from the plant it is on? or could you grow it on a non-living piece of wood or even metal? Just do remember to water it in dry weather. Just because it is an “air” plant doesn’t mean it can live without water. We had clumps of it in our old house. The clumps would grow so large they would weigh down the tree branches. We would constantly give away pieces to friends, and it would just grow and grow. serendipitous to read this post today. 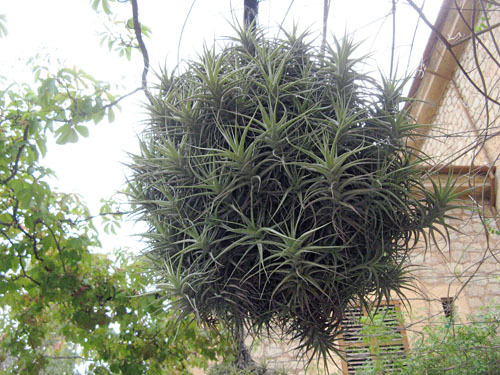 i was thinking about getting an ‘old man’s beard’ air plant for the flat just last night. i was surprised to hear they can live inside very well, and not attached to another plant. Does anyone know of any wholesale nursery’s that sell airplants in Cape Town surrounds?